Harmony enthrals audiences with its wide ranging repertoire of folk music, song and dance from different ethnic groups in China. Since their founding in 2002, the Harmony Ensemble have been invited to perform at the BBC 'Silk Screens', Celtic Connections, music clubs, festivals and The Fringe as well as a full concert with the Scottish Philharmonic Orchestra. 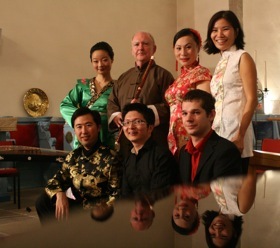 Hooi Ling Eng, percussion and zheng (zither); Cheng-Ying Chuang, counter tenor voice, ruan (moon guitar); Kimho Ip, yangqin (hammered dulcimer), Fong Liu (voice); Eddie McGuire, di-zi (bamboo flute); Willem Mathlener, violin.